Seluxit's IoT platform is versatile, in addition to being field-tested, robust, secure and scalable. 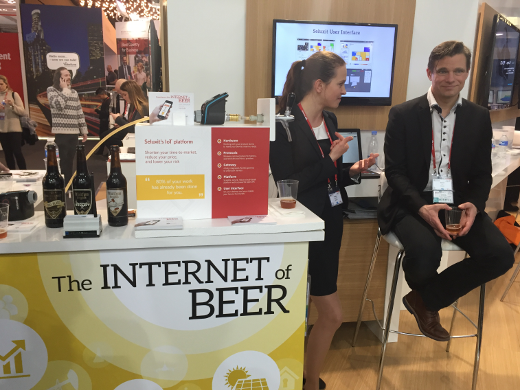 Underpinning this versatility, the theme of our exhibition at the recent Mobile World Conference in Barcelona (22-25 of February, 2016) was “The Internet of Beer”. So the Internet of Beer (making your beverage experience smart) could be just as fully developed as the smart-garden solution our irreverent example actually demonstrated. At Seluxit, we're working towards a future where devices are self-describing, configurable and interoperable, so your lawnmower can meaningfully talk with your smart meter, for example, or your ventilation system with your security system. Right, so what was the Internet of Beer then again? The reality? We were demonstrating work for our customer, Gardena of the Husqvarna Group. The project is a smart garden solution with a robotic mower, humidity sensor, watering computer (for a sprinkler) and gateway. The end-to-end IoT solution essentially enables you to schedule your mowing and sprinkling. The beer came into the picture when it occurred to us that using the watering computer to serve beer would be more fun than demonstrating its true purpose. And the idea then? Well, that's open ended... Our platform is ready anyway.